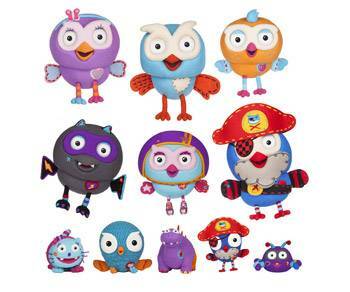 All new Australian-created and produced pre-school series Hoot Hoot Go! (26x5") will make its debut on ABC KIDS on Monday, 16 May. A spin-off of the award-winning ABC flagship property Giggle and Hoot, the series is aimed at 3-6 year olds and will air daily at 8:00am and 5:30pm. Hoot Hoot Go! explores themes of friendship and teamwork through imaginative play and action, and takes a humorous look at the daily problems and situations that occur to its key characters, Hoot, Hootabelle, Pirate Hootbeard, Giggle Fangs, Hootaluna and Giggle Bot, as well as the all new character Hootly, a best friend of Hoot and Hootabelle. The hybrid live action puppetry and CGI series has a distinctive production design, with stitching, buttons, cardboard and textured fabric being combined to give a hand-made look, as if the bright and colourful Land of Giggle and Hoot is literally sewn together. In this world playtime is the primary objective – when characters encounter obstacles the aim is to ensure challenges are dealt with as quickly and as positively as possible with the help of teamwork so that the characters can get back to what they do best - fun and inclusive play. Executive Producer, Jan Stradling, says, 'We are extremely proud to introduce Hoot Hoot Go! to our ABC KIDS audience. Full of energy and positivity, set in a colourful world with bold characters, Hoot Hoot Go! focuses on imaginative play while incorporating elements of pro-social learning and exploring core values such as friendship, sharing and cooperation in a way that is relatable and will really resonate with young audiences. Hoot Hoot Go! is a lot of fun!" New character Hootly is a passionate little orange owl with a keen brain. Curious and inquisitive, she loves fixing things and finding solutions to any problem that comes her way. In her role as Owl Traffic Control on the Night Watch, Hootly checks the nighty-night sky conditions, guides Hootabelle as she Twinklifies, and monitors Hoot as he makes sure everyone is tucked up safely in bed.